Check out some amazing facts about Shruti Haasan. Shruti Haasan, born on 28 January 1986, is an Indian film actress and singer who works in Tamil, Telugu and Hindi language films. She is the daughter of veteran actors Kamal Haasan and Sarika Thakur. As a child artist, Shruti sang in films and appeared as a cameo in her father’s directorial Hey Ram before making her adult acting debut in 2009 in Bollywood film Luck. She has many accolades to her name. Shruti Haasan is very talented and can speak 8 different languages. She started writing scripts since the age of 14 and has also made a short film. Shruti was considered a good- luck charm for Chennai Super Kings in the IPL. She is a trained musician, who is graduated from the Musicians Institute, Los Angeles. Shruti sang her first song in her father’s Thevar Magan in the composition of Ilaiyaraaja at the age of six. Shruti also sang a duet with her father for his Bollywood film, ‘Chachi 420’. The young and beautiful artist is also a good singer, amazing music composer, renowned actress and a great model. She studied at Abacus Montessori School in Chennai and later studied Psychology at St. Andrew’s College, Mumbai. Shruti faked her name in school because she didn’t want anyone to know that she was Kamal Haasan’s daughter. Her fake name was Pooja Ramachandran. Shruti Haasan has an obsession for footwear and has a colossal collection of more than 150 pairs. She was a brand ambassador for the electrical appliance company Lloyd and is a Brand Ambassador for Fossil Watches in India (As of Jan 2019). She also endorses Emami Navratna cool talc. 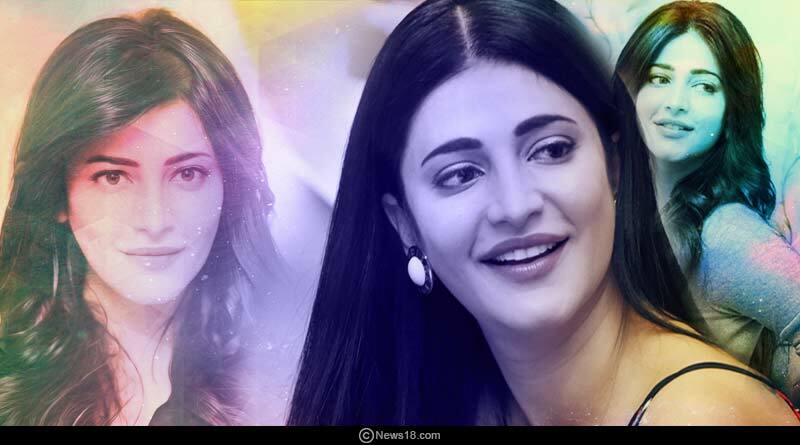 As per a poll conducted by the Chennai Times in 2018, Shruti was named as the most desirable woman. Shruti’s favourite brands are Aldo and Guess. Her favourite makeup brands are MAC and Benefit. She has won and got nominated for many Filmfare Awards. She won the Filmfare Award South for ‘Best Actress- Telugu’ for the action comedy Race Gurram (2015). Her singing has won many hearts, and it is not surprising that the talented actress is also the vocalist of an alternative rock band, “The Extramentals”. Also read: Deaths while taking a selfie – Is it worth taking a dangerous selfie that can lead to death? For more articles like ‘Some amazing facts about Shruti Haasan’, do Subscribe to our newsletter and follow us on Facebook, Twitter and Google+.